I really enjoyed playing with this fun stamp as it tied in to my papers perfectly. Isn't that sentiment SO true?! I have to admit though, it took me a blinkin' age to colour in that dress. I'm quite heavy handed with my colouring and so I do not know how I managed to avoid all of those polka dots on her dress! Stamps: 'Housework Diva' by the Diva Collection from DTDF. Paper: 'Report Card' by October Afternoon. Copic Markers: E00, E11, E50, R02, R35, R37, R59, YR23, Y15, Y17, B32, B39, B45, W1, W3, W5, W7 - available HERE from DTDF. Due to the abundance of spots on this cards, I'm going to enter it in to this weeks Simon Says Stamp challenge. 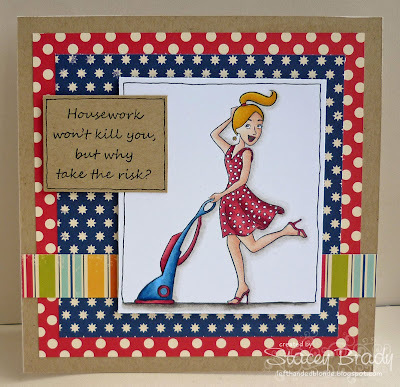 I also nearly forgot, but I followed the sketch over at the Sweet Stampin' Challenge blog. A beautifull card Stacey! Love the colouring with copics! Your card is gorgeous Stacey. Love the image and the papers are wonderful! Stacey this is soooo fabulous!!!!! Your paper piecing is AWESOME!!!!!! What a fun card! Love this card Stacey! The OA papers go relly well with the kraft and the sentiment made me smile! Enjoy your few days in the Isle of Wight! LOL! I totally represent that sentiment!! Brilliant, bright & bold card . . loving that sentiment too . . it's one close to my heart !